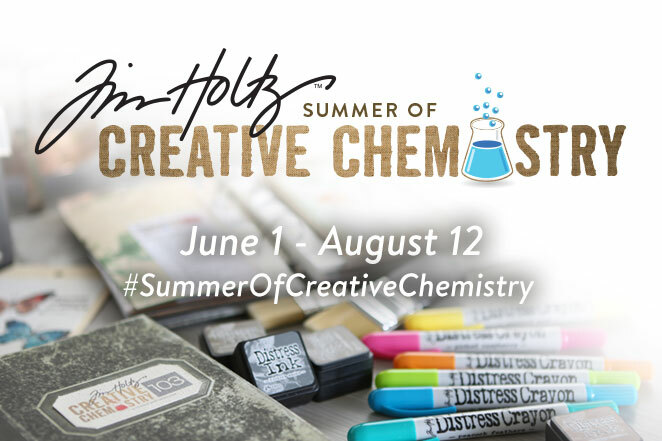 We are thrilled to host a fun, technique-filled summer of Creative Chemistry with Tim Holtz! Starting Wednesday, June 1, we invite all Creative Chemistry students to join Tim as he guides you through Creative Chemistry 101 and 102 once again. Whether you are a new student or a returning student, this summer promises to be jam-packed with inky and “scientific” fun! Plus, we’re capping off the summer with Tim’s new class, Creative Chemistry 103 (open for registration now!). What are Tim’s plans for Summer of Creative Chemistry? Tim wants to encourage all students to refresh your technique knowledge to be ready for 103 in August! Although there are no new lessons in 101 and 102, each week throughout June and July, login to class to see a new challenge that relates to class lesson topics. Plus, the forums will be opened once again for you to talk and chat with fellow students and ask Tim questions too! For the first time, Tim will also be hosting LIVE chats for an opportunity to connect with you personally! Login to class to see when the live chats will take place. We hope to see you there! And don’t forgot to register for Creative Chemistry 103! It will be the perfect ending to a whirlwind summer of colorful techniques and learning. NOTE: Simon Says Stamp is having a sale on Ranger products this weekend, too! Use the code RANGER20 for 20% off Ranger products (May 27-30 at 11:59 PM EST). Go HERE to start shopping! How terrific to have an opportunity to chat with fellow students and Tim about Creative Chemistry 101 and 102 techniques and ideas but WOW how exciting to have a new Creative Chemistry class! I am sure many will flock to see these wonderful classes. Tim and his products and Ranger products are extremely popular. Regretfully, I will have to miss this as I’m having surgery on my leg end of June and won’t be able to sit with a computer for quite a while, having to keep legs up high. This will be hard to accept, but I’m sure I will hear about it all when I resume watching blogs. Have fun everyone! Jealous! So sorry to hear you’ll be on the mend during Summer of Creative Chemistry. But no worries! If you’re already a Creative Chemistry 101 and 102 student, all of the fun will be archived. You will be able to login later and see the challenges and view live chats after they are archived. Well, this made my start of the Summer so sweet. I am signed up once again for 103 and I look forward to the refresher classes of our previous awesome classes in 101 and 102. THANKS TIM AND MARIO for always encouraging us to expand our creativity and teaching us so much. You can have to take the classes in order. 101 is a prerequisite for 102, so the class has to be in your account before you’re able to purchase 102. The same for 103 (102 is a prerequisite). Tim requires this because he wants all students to take the classes in order and not skip any. Can these be taken on an iPhone ? I don’t have interweb connections for my new MacBook yet and not a clue how to use it ? Yes, you can access all classes from mobile devices. Can I register and pay for all 3 of tim’s classes at once? No, you cannot purchase all three classes at once. 101 is a prerequisite for 102, so the class has to be in your account before you’re able to purchase 102. The same for 103 (102 is a prerequisite). Tim requires this because he wants all students to take the classes in order and not skip any. If we have taken Tim’s classes 101 and 102 before, they are still available, right? I haven’t tried to log on for awhile. Yes, you should be able to login and see both classes on your My Account page. Wow! what an awesome opportunity!! Would I have to have enrolled for Creative chemistry 101 and 102 to take the 103 class? Also, If I buy the 103 class, will I have access to the refresher on 101 and 102? You have to take them 1 at a time. Completing 101 gives you access to do 102. Once they have both been completed, then you can do 103. They each have prerequisites for the next. Hope this helps! I am so excited. I loved the first 2 classes and still watch them. I can’t wait to see Tim using the new products and the love the live chat. How fun! I purchased the 101 class a long time ago but never got around to view all lessons and play, so this will be a great incentive to start again! This is so exciting! I loved 101 and 102 and still refer back to them. Looking forward to new ways to play and inky fingers. See everyone there. Is it possible to know what are the necessary materials for the classes? Thank you! Tim has not compiled a supply list for 103 yet. Registered students will receive an email letting you know when it’s available. Thanks, I was wondering if we would have a list of supplies needed for 103! Is there an option to purchase all three classes in a bundle with a discount? No, there is not. 101 is a prerequisite for 102, so the class has to be in your account before you’re able to purchase 102. The same for 103 (102 is a prerequisite). Tim requires this because he wants all students to take the classes in order and not skip any. Any idea how these classes line up with the in person creative chemistry class that Tim is teaching ilthis summer ? I’m signed up for the one in Los Gatos and I don’t know if the online 101 102 classes would be better taken before the online class. Oooh great! Down here, we’re all upside down and wintery. Can’t think of anything better to do to keep cosy in our winter here in OZ. Just signed up for 103, I love Tim and Mario! I have never been disappointed with Tim Holtz classes, even if you know the techniques his energy and enthusiasm makes it worth it. This is a great way to avoid AZ heat. This is so exciting! I haven’t been able to create in a very long time since I decided to go back to school. However, I will only take one course during the Summer semester… soooo yay!! Oops… I guess I was so excited that I clicked twice the post comment button.. sorry! Thanks Tim! I am looking forward to being inspired and meeting new members! Looking forward to a summer of Creativity Chemistry!! I have loved the Distress line and Tim’s products since the very beginning. Excited to get back in the groove and refresh on the basics and learn lot’s of new things too!! I am so excited to go over all this again and I can not wait for August too!! I have been out of the loop for a bit and hopefully this will get me back to being creative again. Yay!! Can not wait to start!!! Just what I needed to get me out of a recent creative slump. I’m going to get signed up for 103 now before I forget and miss out. 101 and 102 were well worth the $. I allows me to properly educate my customers about the products we offer. Money well spent! Can’t wait for 103…and this Summer of Creativity refresher of 101 and 102! How do I access 101 please? According to my account I only have 102, although I did do 101 when it first came out? Can’t wait to get strrted. Hello I can’t find the log in area! I have taken a class in the past that I can’t find and I signed up for tim Holtz #1 how do you get into the classes I can’t find it! Help!! I have enjoyed day 2’s techniques and am about to blog and share my results. I need to go on to day 3 when I get some time tomorrow. Thanks for the inspiration. Sorry If I have added this to the wrong place. finding my way around. Thanks for this review and the new class. I love my account with you. It is easy to access and use and the best bank for my buck. Looking forward to August Chemistry 103…registered and excited. Love the new web site and organization. You have helped me, as those above, when we just get stuck…..keep up the good work. Starting with Chemistry 101 starting June 1 through June 30~would I be able to enroll anytime during the month or is it crucial to enroll on the 1st? Is each day a new class during the whole month? Just trying to understand how the classes work since today is the first I am aware of these classes. Very exciting. I’m secretly always hoping for a Tim Holtz Christmas class :)! I purchased Creative Chemistry 101 and 102 when they were first done…now i can’t find any way to log in…everything i look at wants me to purchase, and doesn’t show me where to log in. help! Mary, click on MY ACCOUNT at the top of any page. After logging in, you will see you classes listed on the left. Is there a discount code for #3 if you register for it by a certain date? I am having so much fun go back over the lesson in preparation for the new one. thanks for always inspiring me! The techniques so far are WOW… taking products to a whole new level. Thank you Tim for for sharing your creative and artistic gift. are these classes available now?